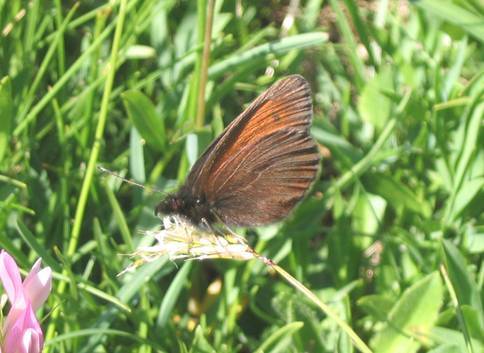 The Mnestra's Ringlet flies locally across high Alpine meadows. The underside of the male is quite characteristic; the hindwing is a very warm, uniform brown and the forewing shows an orange colouration extending right down to the basal area. He is often illustrated without eyespots but minute ocelli at the top of the postdiscal band on the forewing are sometimes present as in the above photograph. I've not seen a female but her undersides are more contrasted and small ocelli are usual on the upperside.